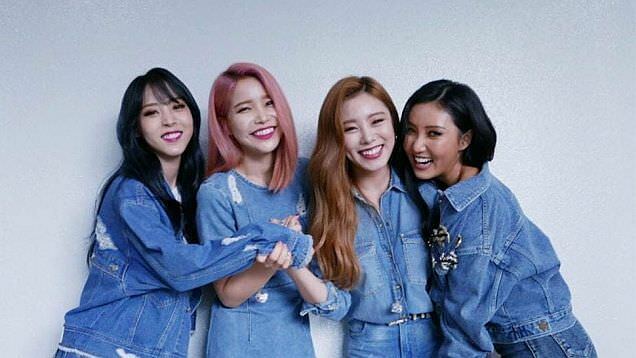 MAMAMOO has dropped their newest release, 'BLUE;S,' the third in their 'Four Seasons, Four Colors' tetralogy, a seasonal themed multi-EP project. With each new release, a different band member gets a chance to shine in a solo track. This time around it's Solar. The project compromises some of their strongest work to date and shows just how talented these ladies are. The intro track, "From Autumn to Winter," is a pretty song. Coming in at half the running time of a normal tune, it is a lovely intro to the rest of the EP. It's got an acoustic guitar driving it, and it's very soothing, almost hypnotic. "No More Drama" is a direct counterpart to that, with plenty of percussion and energy. And we have the top-notch vocals that made these girls superstars in the first place. The title track is "Wind flower," and is meant to be a follow up to the smash hits "Starry Night" and "Egotistic." Is it as good as those songs? Not really. It's not a bad song by any means, but I'm not sure I would have chosen it as a promotional track. It's kind of got some Western swing elements, and the chorus is cute. We get a soft pop offering in Solar's solo track "HELLO." I happen to like her voice better than the other members. This isn't a commentary on them, just my preference. She makes her voice high and soft in one breath, and the next turn it sharp and edgy. She kills it on this track. "Better than I thought" has some folksy vibes to it, with acoustic guitars and some simple hooks. It was probably one the best tunes to follow "HELLO." They keep it low-key with the ballad "Morning." (You knew with a title like that, it would probably be a ballad, right? Nothing gets past you guys). I love how this one develops, too, with some rap parts and an exquisite emotional denouement. This is a superb outing for the quartet. When you have eight EPs under your belt, you have to expect quality. And we found it. I wasn't all about the promotional track, but it grows on you over time. It's short and sweet and to the point. It's all about breakups, as the warmth of summer gives way to the chill of autumn and as leaves change, so do lovers. And these girls manage to offer something a bit different each time. Nice job. This MV finds the girls on the streets of Tokyo. The video is awash in neon and reflected lights in the puddles on a wet autumn Tokyo night. The camera angles make the thing even better as the girls ham it up during their individual scenes. And there are a lot of individual shots, as the song is about loneliness. And so there are quite a few pensive stares as the camera works to capture their best sides. And the girls (except for Hwasa) switched up their hair. Solar's mane is now a silky black, Moonbyul's is now an earthy brown, and Wheein has dyed her hair a more natural color (no more shock of platinum blonde) and relaxed it. I didn't think this was possible, but it makes them even more attractive. And there was something off about this. I remember Solar having that mole over her right eye in both "Starry Night" and "Egotistic." In this one, it's over her left eye. Unless moles migrate, I think someone, either the director or the editor, flipped the film. It doesn't affect my opinion of the MV one way or another, but I thought it was noteworthy. For extra points, watch it switch places again about halfway through. Still, the MV is gorgeous. The girls are too, but there's something about a city at night that is a huge draw for me (and I live in a medium-sized city, so go figure). With stunning girls and stunning scenery, there's not a lot I can find fault with here. As good as their other ones in this sequence? Yeah, without a lot of the CGI that they used in the past. They don't need it. Sometimes the city is the best backdrop. Um. The MV was in Hong Kong..